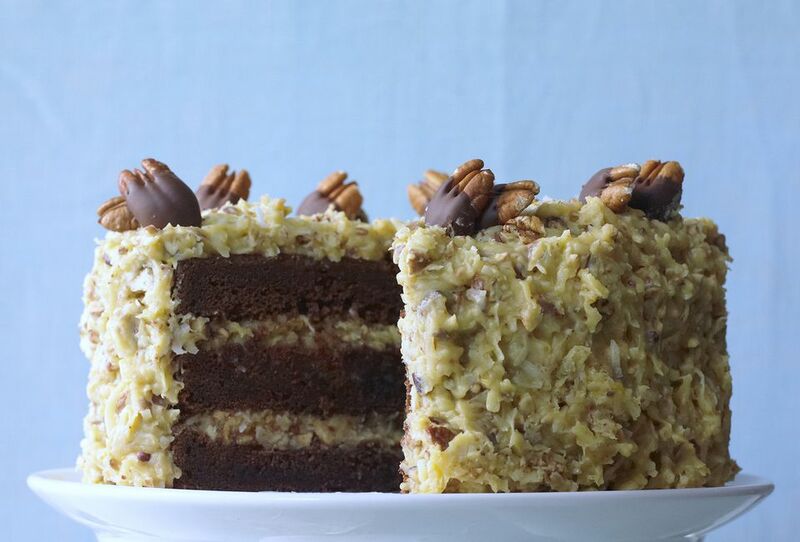 This is a recipe for German chocolate cake from scratch, with a coconut pecan frosting and filling. Layer up with this homemade layer cake and begin to feel the magical-ness of German sweet chocolate. It's so delicious that you'll probably have more than one piece and that is OK! Grease two 9-inch layer cake pans and line bottoms with waxed paper. Sift together flour, sugar, baking soda, baking powder, and salt. Cream butter; add flour mixture, 3/4 cup buttermilk, and vanilla. Stir until dry ingredients are moistened; beat at medium speed of electric mixer for 2 minutes, scraping bowl from time to time. Add melted chocolate, eggs, and remaining 1/4 cup buttermilk. Beat 1 minute longer. Pour batter into prepared cake pans. Bake in a preheated 350 F oven for about 35 minutes, or until a wooden pick inserted in the center comes out clean. Cool in pans on rack for 15 minutes. Remove and cool completely on racks. Frost with coconut pecan frosting, below. In a saucepan over medium heat, combine milk, sugars, butter, and vanilla. Bring to a full boil, stirring constantly. Remove from heat (mixture might appear a bit curdled). Quickly stir a small amount of the hot liquid into the beaten egg yolks; return egg yolk mixture to the hot mixture in saucepan and blend well. Return to a boil, stirring constantly. Cool to spreading consistency, beating occasionally.